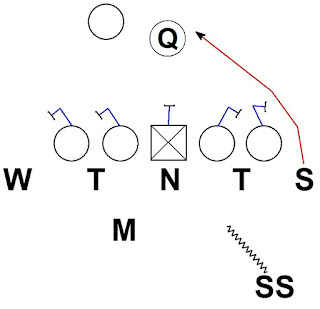 Cleveland Browns' Defensive Coordinator Ray Horton brought this middle overload blitz in week 17. The coverage could be a cover 1 variation or a 2 under 3 deep match up zone concept. Without knowing the call it is hard to tell. Either way the coverage defenders are playing very aggressively on the receivers knowing the overload pressure is going to prevent the QB from holding the ball. The protection has the numbers (6 vs. 6) to pick up the rush. The conflict for the OL is expected threats vs. actual rushers. Initially the OL has an easy pick up in concept. 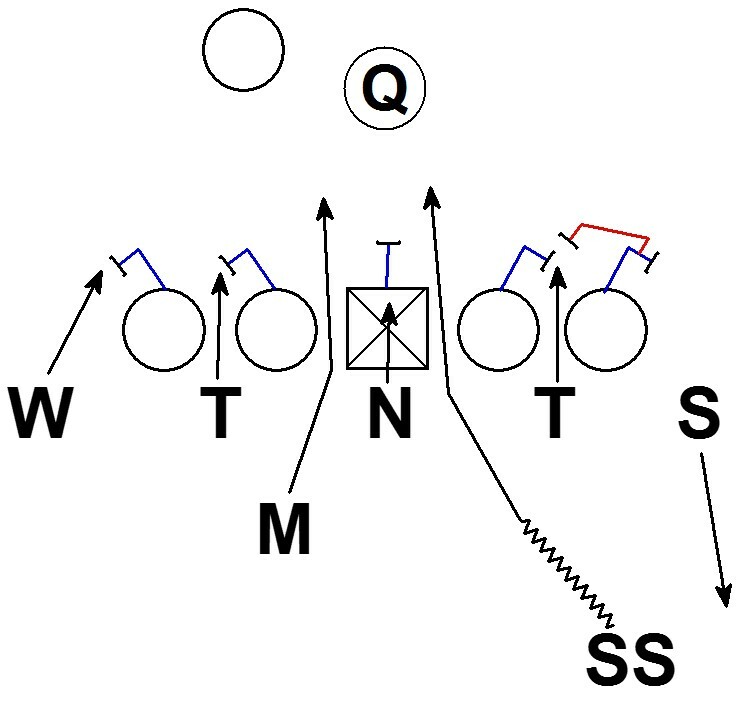 The OL handle the 5 rush threats on the LOS and the RB has the Mike backer if he rushes. When the SS rolls down into the box to rush the A gap and the Sam drops in coverage, the clean 6 vs. 6 picture changes for the OL. The OG and OT who set to the initial threats of the DT and Sam would be forced to redirect to the inside to pick up the new rushers. The OT could see the Sam drop and redirected inside. The Guard was already engaged with the DT and missed the redirection leaving the SS unblocked in the A gap. 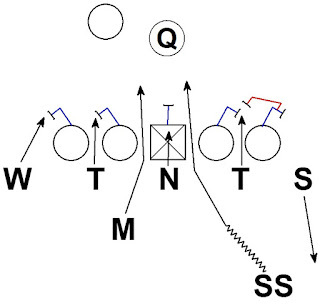 Even if the Guard identified the Sam dropped into coverage, the blitz pick up is difficult. 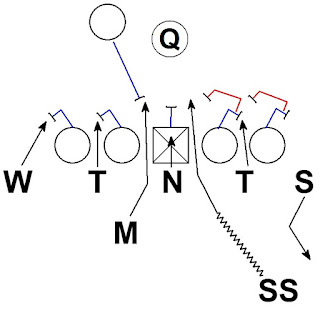 The Guard has to redirect to block a full speed blitzing SS. 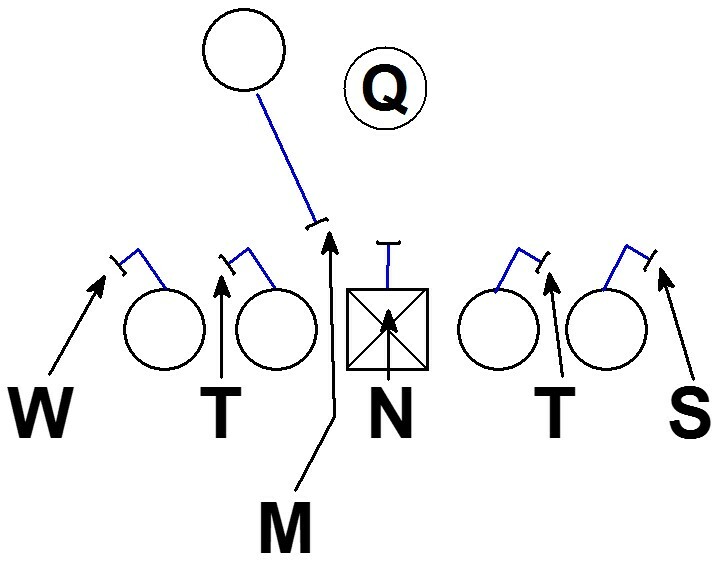 The OT is left alone on a 3 technique with an inside rush lane to the QB. Both blocks are difficult. The OT has a tough situation when the SS rolls into the box as well. 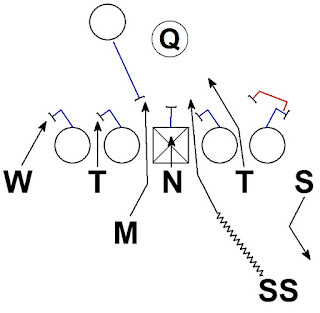 The OT could set to provide better body position on the 3 tech. By setting this way the OG and OT would have a better chance to redirect to the pressure. The issue is the OT doesn't know the SS is going to rush or that the Sam is going to drop. The walked up LB on the LOS is the more likely rush threat than a high safety rolling down. If the OT doesn't set the Sam, the risk of getting beat on a speed rush goes up. The percentages say the Sam is going to rush therefore giving the more likely rusher an easy speed rush is an unlikely plan for the OT. Why didn't the QB throw hot? The protection can pick up 6 in principle but cannot block 7. 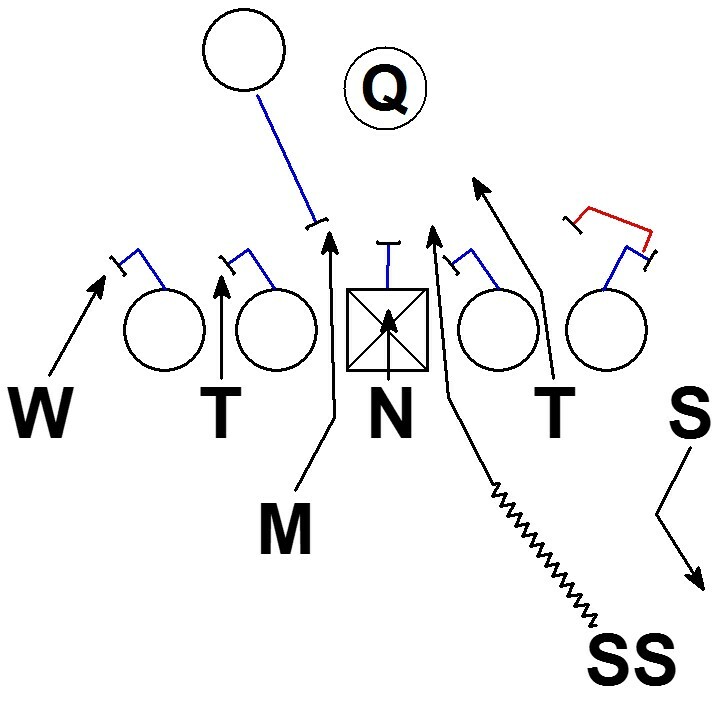 Five rushers on the LOS plus the Mike & SS is 7 in the pressure picture. Once the Sam drops from the LOS the pressure picture no longer has 7 threats. The read to throw hot is not clear. There is a QB adage "If you don't know, don't throw." and in this situation the QB has a confusing picture to process. The coverage is also designed to denying hot throws. The corners are pressed and denying anything easy to the outside. 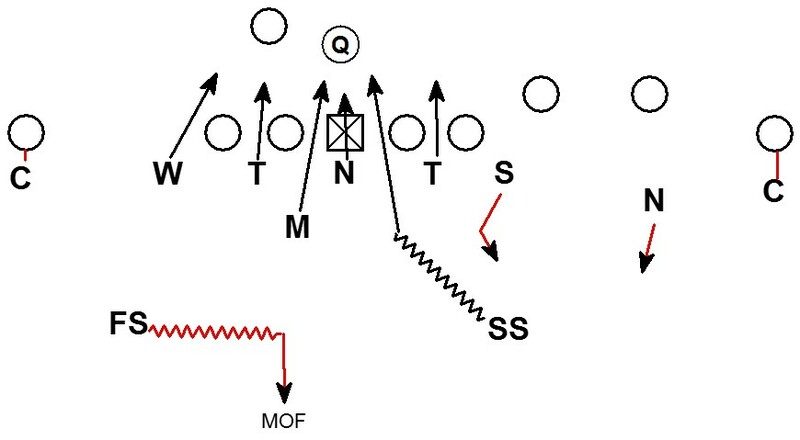 A MOF safety is over top of the inside receivers. 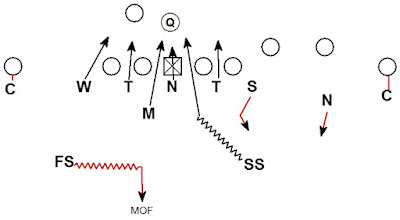 The 2 underneath defenders are there to play any quick throws to #2 or #3. Unclear hot read + tight aggressive coverage + immediate unblocked A gap pressure in the face = sack. Good stuff from the Browns on 3rd & 6. How do you handle a RB release to the Sam LB side? Let the Nickel come off #2 late with #4 to the flat to make the tackle. The MOF safety squeezes to midpoint the verts of #2 and #3. The pressure is on the QB fast enough that the route really can't stretch the coverage too far. Thanks for the reply. 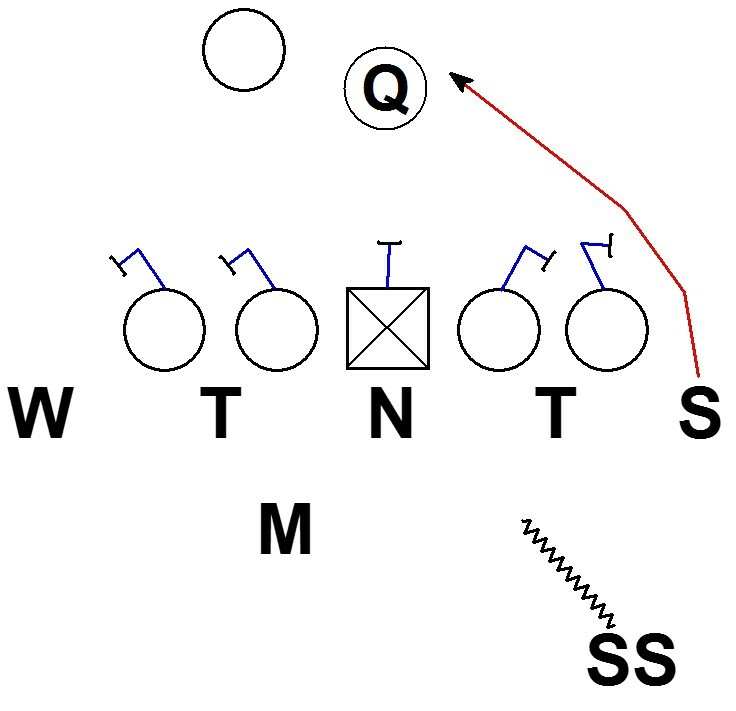 What would change with the same RB release vs. a 2x2 set?